Description: Germany’s example provides the proof that even one of the world’s biggest national economies can master the transition to renewable energy sources. By 2014 Germany was already covering 28 percent of its electricity needs from renewable sources: wind, solar and hydropower power, and biomass. With constantly new legislation and regulations, the Federal Government is mapping a pathway for the energy market. The transition is not without its complications: costs required to keep the electricity grid stable, and the safe dismantling of nuclear plants still represent major challenges. However, the reliability of the electricity supply in Germany remains high compared with other European countries. The goal of the Federal Government is to drive the proportion of electricity from renewables up to 35 percent by 2020. Why do we love it: Proving that the energy transition can be a success story. Germany gives reassurances: The transition to green energy is achievable albeit expensive and demanding. The 25th July 2015 did not turn out to be a beautiful summer’s day for all Germans. In the south the sun shone, while in the north Hurricane Zeljko reared its ugly head. What made it a jubilant day despite everything was the turnaround that was achieved in Germany’s energy policy. On that day 78 percent of Germany’s electricity needs were covered by renewable energy sources – more than ever before. In the north the hurricane brought the wind turbines on the coast into full swing, in the south the sun had the solar cells blazing. At their peak the renewable energies delivered an output of almost 48 gigawatts. Not even 50 coal-fired power stations can achieve this without taking strain. Conservation and the German branch of “Friends of the Earth”. Germany is proof that even one of the world’s biggest national economies can master the transition to renewable energy sources. However, Germany is also providing an example of how complicated and complex energy transition can be. The costs can get out of hand and the networks reach load limits. Wind and solar power, biomass and hydropower: in 2014 Germany was already covering 28 percent of its electricity needs from renewable sources. The goal of the Federal Government to drive this up to 35 percent by 2020 is therefore an entirely achievable vision. In 2000, when the German Renewable Energies Act (EEG) was introduced and energy transition began, it did not even constitute seven percent. The EEG represented a boom for wind and solar energy, for it guaranteed everybody who invested in alternative electricity generation a fixed compensation for every kilowatt hour of “green” electricity, which would more than cover the costs. Not only did electricity suppliers build wind turbines on a large scale; private households also installed solar facilities. Germany can still manage the boom in wind and solar energy. If one were to convert local power outages to spread across all electricity consumers, the average outage period of interruption in 2014 would have been as little as 12.28 minutes. “The reliability of electricity supply in Germany compared to other European countries continues to remain on a very high level,” emphasises Jochen Homann, the president of the Federal Network Agency responsible for the energy networks. In comparison: In Great Britain it is more than 80 minutes on average, in France more than 100 and in Italy more than 150. In reality there was a big fear of power blackouts when Germany accelerated its energy transition in 2011 after the Fukushima reactor catastrophe, taking eight of the 17 remaining nuclear reactors off the grid without delay. Chancellor Merkel has however sounded a strong warning: “We currently find ourselves in a critical phase where the proportion of renewable energies that were once a niche market have surfaced to becoming the central pillar of our energy supply.” There is one thing in particular that is causing her concern: Rising energy costs. Energy transition is costing Germany a lot, with it having to go to great expense and effort to keep the electricity grid stable. The consumers are paying for it. The difference between the high compensation paid for “green” electricity and the electricity price, which forms in the wholesale trade, is being charged to the electricity users by the network operators. With the rapid expansion in plants built, this EEG levy has accumulated: Every electricity customer must meanwhile transfer 6.17 cents in EEG levies for every kilowatt hour used – this is more than a quarter of the overall electricity price. Calculated across all electricity users this EEG levy amounts to 21.8 billion Euros for this year alone. The grid operators also face great challenges due to the rapid expansion of wind and solar energy. In peak times renewable energy sources may already cover 70 per cent of demand, as was the case on 25th July. On overcast winter days when the clouds obscure the sky and there is hardly any wind, the output can rapidly drop to a percentage that you can count on the fingers of one hand, as was the case on that fatal 25th July. The more that electricity availability is contingent upon weather conditions, the more difficult it becomes to avoid electricity outages. The grid operators are forced to redistribute the electricity. In southern Germany, where industry needs plenty of electricity, nuclear plants are going off the grid and entire offshore wind parks are developing along the northern coastline. The Federal Government is at great pains to turn the project of energy transition into a success story. With constantly new legislation and regulations it is trying to map out a new pathway for the energy market. In the past year the renewable energy law was reformed. EEG 2.0 means that compensation will be reduced and the unrestrained expansion of renewable energies controlled. Now the Federal Government is working towards protecting the gas power stations which are being forced out of the market due to sinking wholesale electricity prices because of the boom in wind and solar energy, while filthy coal plants remain on the grid. Aside from all this there is one particularly large problem that must be resolved: How is the dismantling and safe waste disposal of nuclear plants being controlled? Energy transition in Germany is on the right path, however still a long way from completion. L’Allemagne donne l’exemple : la transition vers une énergie écologique est possible. Mais elle est chère et ambitieuse. Le 25 juillet 2015 n’était pas une belle journée d’été pour tous les Allemands. Le soleil brillait au sud, l’Ouragan Zelijko se déchaînait dans le nord. Mais pour la transition énergétique en Allemagne, c’était jour de fête : 78 pourcent des besoins en électricité de l’Allemagne étaient couverts par des sources d’énergie renouvelable, du jamais vu jusqu’ici. Sur la côte nord, l’ouragan faisait tourner les éoliennes à plein régime, au sud, les cellules photovoltaïques s’échauffaient sous l’effet du rayonnement solaire. Les énergies renouvelables ont atteint un pic de puissance d’environ 48 gigawatts, un rendement que même 50 centrales à charbon ont peine à fournir. La transition énergétique allemande s’opère inexorablement. 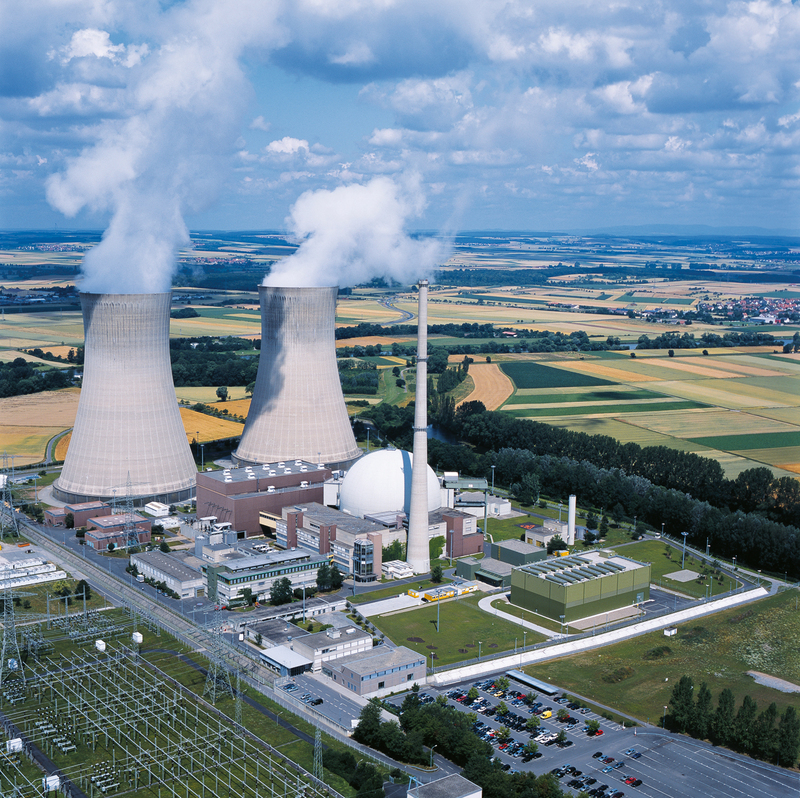 Un mois plus tôt, dans la nuit du 27 au 28 juin, à 23h59 précises, la centrale nucléaire de Grafenrheinfeld (Bavière) a été déconnectée du réseau. Pour toujours. Le réacteur a fonctionné pendant 33 ans et, d’un point de vue technique, la centrale aurait pu encore produire de l’électricité pendant une vingtaine d’années. Mais elle était la prochaine victime visée par la politique du gouvernement de la Chancelière Angela Merkel concernant la sortie définitive du nucléaire civil. « Nous demandons depuis des années l’abandon de la technologie nucléaire qui représente une menace mortelle. La fermeture définitive de la centrale de Grafenrheinfeld est une victoire et une occasion de se réjouir », déclare Hubert Weiger, président de l’Union pour l’environnement et la protection de la nature en Allemagne. L’Allemagne prouve ainsi que même l’une des plus grandes économies du monde peut maîtriser la transition vers les énergies renouvelables. Mais l’exemple de l’Allemagne montre également à quel point cette transition énergétique est épineuse et complexe. Les coûts associés sont difficilement contrôlables et les réseaux commencent à atteindre leurs limites de charge. Eolien, solaire, biomasse et hydraulique: dès 2014, 28 pourcent des besoins énergétiques de l’Allemagne étaient couverts par ces sources d’énergie renouvelable. L’objectif du gouvernement d’élever ce chiffre à 35 pourcent d’ici 2020, est donc parfaitement réalisable. En 2000, lors de l’adoption de la loi allemande sur les énergies renouvelables (EEG) et du lancement de la transition énergétique, seuls 7 pourcent étaient couverts. Cette loi a fait connaître un boom aux énergies solaires et éoliennes, car elle garantit à toute personne qui investit dans la production alternative d’électricité une rémunération fixe pour chaque kilowattheure d’électricité verte, couvrant davantage que les coûts encourus. Et non seulement les fournisseurs d’électricité ont construit des éoliennes à grande échelle, mais des centaines de milliers de résidences privées ont également installé des équipements solaires. L’Allemagne est encore capable de maîtriser ce boom des énergies solaires et éoliennes. Si l’on ramène les interruptions locales d’électricité à tous les consommateurs d’électricité, la durée moyenne des interruptions s’élevait de 12,28 minutes en 2014. « La fiabilité de l’alimentation électrique en Allemagne continue d’être largement supérieure à celles des autres pays européens », souligne Jochen Homann, président de l’Agence fédérale allemande en charge des réseaux énergétiques. À titre de comparaison : la moyenne du Royaume-Uni est de plus de 80 minutes, celle de la France de plus de 100 minutes et celle de l’Italie monte même jusqu’à plus de 150 minutes. La crainte d’un blackout était cependant élevée, lorsque, suite à l’accident nucléaire de Fukushima de 2011, l’Allemagne a accéléré sa transition énergétique et immédiatement fermé huit des 17 centrales nucléaires restantes. La Chancelière Angela Merkel met néanmoins en garde : « Nous sommes actuellement dans une phase critique, au cours de laquelle les énergies renouvelables, autrefois marginales, sont devenues notre principale source d’alimentation énergétique ». Ce qui l’inquiète en particulier sont les coûts énergétiques de plus en plus élevés. La transition énergétique coûte cher à l’Allemagne et la stabilisation de son réseau électrique nécessite des efforts considérables. Et ce sont les consommateurs qui en payent le prix. Les exploitants du réseau reportent sur les consommateurs la différence entre les tarifs élevés liés à l’électricité verte et les prix de l’électricité fixés sur le marché global. En conséquence de la forte croissance de ces constructions, un système de prélèvement uniforme a été établi dans le cadre de la loi EEG : chaque consommateur doit maintenant reverser 6,17 cents par kilowattheure utilisée, soit plus d’un quart du prix total de l’électricité. Ces prélèvements répartis sur l’ensemble des consommateurs s’élèvent à 21,8 milliards d’euros au total cette année. L’augmentation rapide des installations solaires et éoliennes entraîne également d’énormes difficultés pour les exploitants du réseau. Lors de pics d’utilisation, les énergies renouvelables couvrent certes déjà plus de 70 pourcent des besoins, comme en ce 25 juillet. Les jours sombres d’hiver, lorsque le ciel est couvert et qu’il n’y a pratiquement pas de vent, ce pourcentage tombe rapidement à quelques 5 pourcent. Et plus l’approvisionnement en électricité fluctue en fonction des conditions météorologiques, plus il est difficile d’éviter les coupures de courant. Les exploitants du réseau doivent en même temps redistribuer l’électricité. Tandis que dans le sud de l’Allemagne, où le secteur industriel consomme beaucoup d’électricité, les centrales nucléaires sont fermées, des parcs éoliens offshore apparaissent le long des côtes du nord. 4 000 kilomètres de lignes à haute tension devraient être construits dans les dix ans à venir, ce qui nécessite un investissement d’au moins 20 milliards d’euros. Trois principaux tracés sont planifiés pour distribuer l’électricité de manière suprarégionale. Südlink, le plus grand, traverse l’Allemagne du nord au sud sur plus de 800 kilomètres. Il faudra près de 10 ans pour la planification et l’achèvement des travaux. Mais la construction de ce réseau est en suspens : certains citoyens locaux s’opposent à l’établissement de ces infrastructures dans leur environnement. « 2015 sera une année décisive pour la réussite de la transition énergétique », déclare Hans-Jürgen Brick directeur d’Amprion, grand exploitant de réseau. « Si le développement du réseau ne s’accélère pas, alors la transition énergétique risque d’en être bloquée ». Le gouvernement fédéral fait des efforts pour mener le projet de transition énergétique sur la voie du succès, et essaie d’équilibrer le marché énergétique par de nouvelles lois et règlements. La loi allemande sur les énergies renouvelables a été réformée l’année dernière. Avec cette deuxième version, les tarifs d’achat seront réduits si le développement effréné des énergies renouvelables parvient à être maîtrisé. Le gouvernement fédéral travaille actuellement sur la protection des centrales à gaz qui sont exclues du marché par le boom des énergies solaires et éoliennes et la chute des prix de l’électricité du marché global, alors que les centrales à charbon polluantes restent raccordées au réseau. Il reste également un autre gros problème à résoudre : Comment gérer le démantèlement et l’élimination des centrales nucléaires en toute sécurité ? La transition énergétique est en bonne voie en Allemagne, mais elle est loin d’être achevée.